Dining with Diabetes Down East class with Alan Majka. Diabetes is a large and rapidly growing public health problem for Maine and the United States. Maine’s most northern and eastern counties tend to have the highest rates, in part due to older populations. Type 2 accounts for approximately 90% of all diabetes cases. According to the American Diabetes Association Standards of Care, lifestyle management is a fundamental aspect of diabetes care and includes self-management support and nutrition therapy. UMaine Extension complements health care by providing accessible community-based self-management support and practical nutrition information. Researchers confirmed type 2 diabetes treatment goals in a March 2018 Diabetes Research and Clinical Practice article. The authors reviewed Veterans Administration electronic medical records for 53,120 patients with type 2 diabetes. Those who met guidelines for two goals did better than those who met only one or no goals. The Dining with Diabetes website includes four publications and a series of 7 videos to help you meet these goals. For decades, Cooperative Extension has offered diabetes education in many states. For example, University of Georgia Cooperative Extension developed the Rite Bite Diabetes Cooking School in 1995 and in 1998 West Virginia University Extension Service started the Dining with Diabetes program that later became a model for Extension diabetes programs in other states. There are a number of ways to plan meals for someone with diabetes or prediabetes. In an effort to simplify diabetes meal planning, a group of dietitians in Idaho adapted a teaching tool originally developed in Sweden. They called it the Idaho Plate Method. The plate method has been tested and has become widely accepted. In fact, it’s specifically listed as an effective meal planning approach in the American Diabetes Association’s Nutrition Therapy Recommendations for the Management of Adults With Diabetes. The plate method became the basis for the original Dining with Diabetes program and is used in UMaine Extension’s Dining with Diabetes Down East. 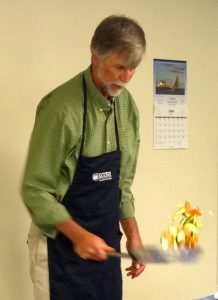 UMaine Extension registered dietitian and nutritionist Alan Majka provides presentations, leads discussions, and demonstrates preparation of nutritious recipes that participants can sample. This free program complements medical care by teaching people in Washington and Hancock Counties with type 2 diabetes or prediabetes, and their family members and caregivers, what they can do to help control body weight, blood sugar, blood pressure, and cholesterol. 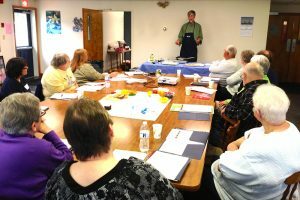 UMaine Extension registered dietitian and nutritionist Alan Majka provides presentations, leads discussions, and demonstrates preparation of nutritious recipes that participants can sample. There are opportunities to taste a variety of main dishes, side dishes, and desserts. Participants typically meet for two hours, once per week, for four consecutive weeks. As of October 2017, 241 people have participated. If you are interested in participating in this program, or would like to request it for your Washington or Hancock County community, please call 207.255.3345 (toll free in Maine: 1.800.287.1542). A schedule of upcoming programs may be found on UMaine Extension’s Washington County Dining with Diabetes website. I went to the diabetic teaching classes you taught in Eastport this summer and I wanted to let you know how much you helped me get my diabetes under control. Before I came to your classes, I was taking medication for my diabetes in the morning and at night and I’m happy to report that I now take no medication for it at all! I started really watching what I was eating and that, along with exercising every day, made all the difference. My glucose levels stay pretty consistent all day, running from about 80-120. I’ve lost about 25 pounds and I feel great. Thanks for helping me understand what I needed to do to get these results. It was a great program and I’m glad you took the time to teach it. A year ago, I took the Dining with Diabetes Down East class and I found it to be informative, easy to follow, well organized and fun. The class is sponsored by the University of Maine Cooperative Extension and Alan Majka is the teacher. To tell you the truth, I am fed up with counting carbs, counting fat grams, counting calories and on and on. The biggest thing that bothers me is eating food that is good for me and tastes like cardboard. Well, Dining with Diabetes Down East has put a new perspective on eating for me. Mr. Majka teaches a few basic principles, a way of looking at a plate of food and puts it all together in a way that works. No hours of agonizing; just doing it, now. Besides all that, he makes a few foods at the end of each class that taste good. No, not good…great. I started doing what I learned in class and my A1C test, which was in the diabetic range, is now in the normal range and I have lost 30 pounds.